This post is the Forth in a Series on Microsoft Dynamics Nav 2013R2 Development, Parts One and Two Covered Module 1, this Post is the “Code Behind” Module 2 a Global Currency Dashboard Shown in Part One this Module, “Objects in Text Format can be Downloaded” at the Foot of this Post. This Scenario has come up before on several occasions however I had never Designed a Solution, many Companies Deal with Multi-Currencies in multiple Companies, when they want to Update the Currency Rates they go into each Company and manually Update the Rates one Line at a Time, if there are a few Companies this can be very Time Consuming. 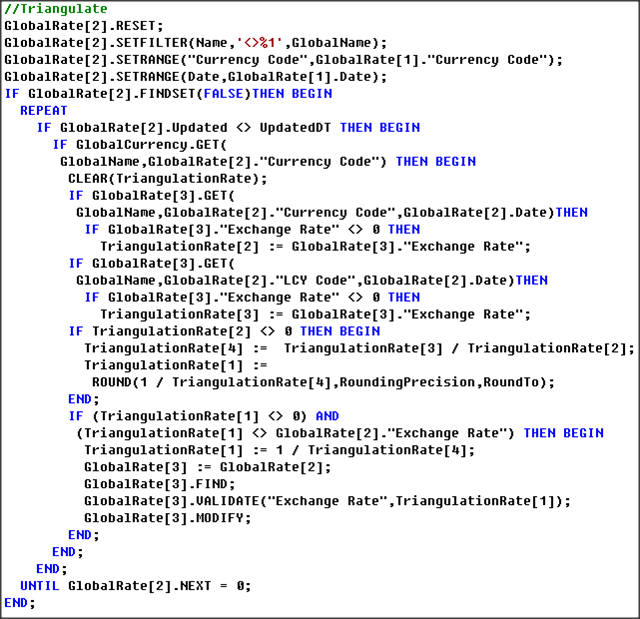 Module Two requires a more advanced solution than Module 1 and can be run in a Parent Company, the Global Currency Workbook has the following Functions, Get Currencies across all Companies, Get Currency Exchange Rates across all Companies, update the Rates by Triangulation of the Rates from the Parent Company and Insert or Update the Rates across all Companies. 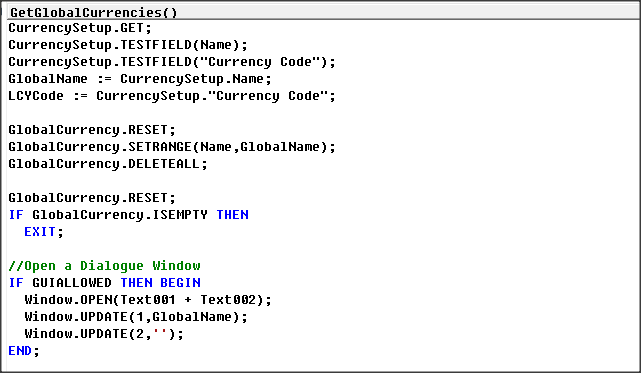 In this Post I will only be showing some of the Code Behind Module two as all the code can be downloaded at the Foot of This Page, there are some field name changes from Module 1, if you have a working copy of Module 1 then delete the Table Contents before Importing the Changed Objects. 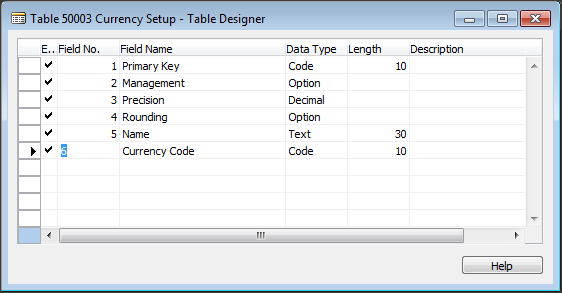 This Table is used to Hold some Default Values, More Fields will be added for the third and Final Module. 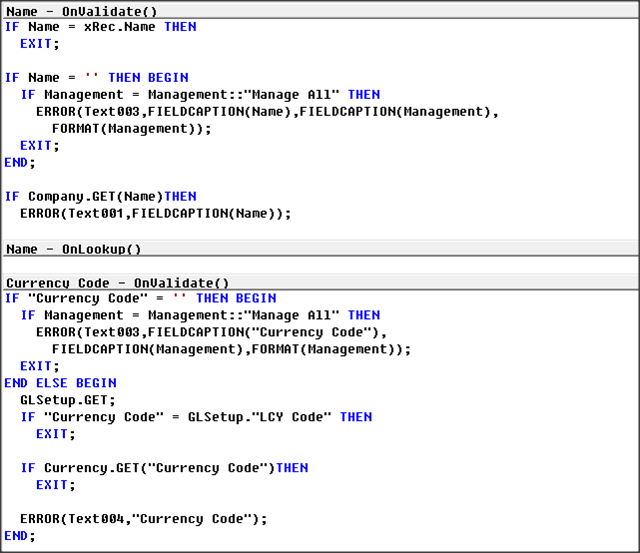 There is a little Validation Code in two of the Fields when the Management is set as “Manage All” the two fields cannot be Blank. 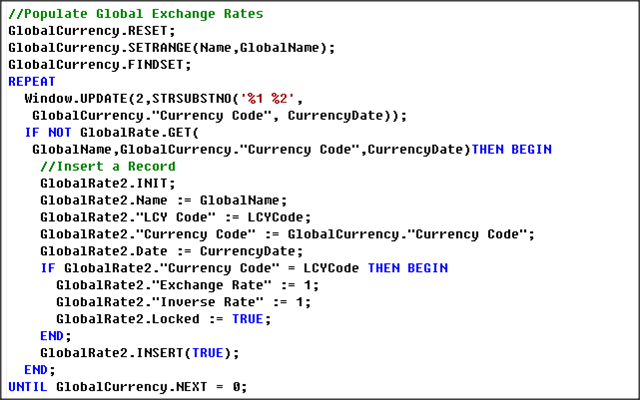 This table has had a couple of Fields Re-Named and New Validation Code to Maintain the “Inverse Exchange Rate” Calculation, and “Exchange Rate” Calculation. This Page is Used to Manage the Global Currencies and has Page Actions like the Currency Worksheet to Populate and Assign the Data and has a Table Relation to the Currency Setup Table. 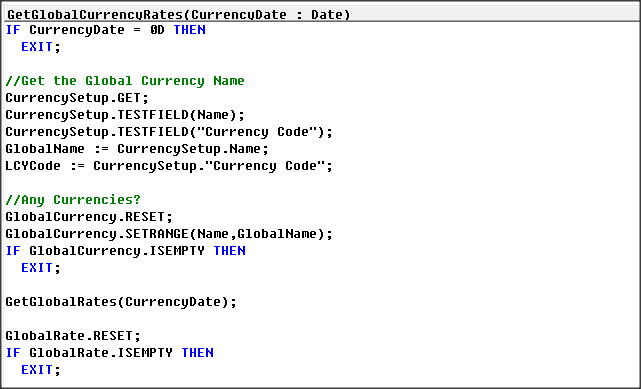 Some of the Functions from Module 1 have been Updated to Deal with Global Currencies by Populating the Company Name into the Name Field, the ApplyCurrencyRates function had an error where it only Updated One line at a time this has been fixed. 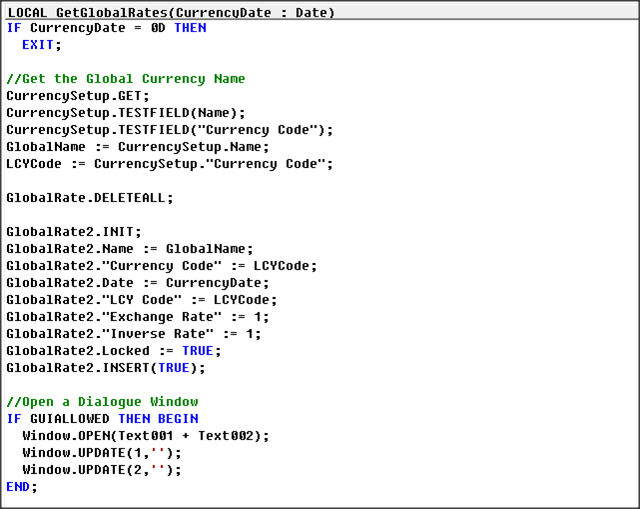 The Function GetGlobalCurrencies populated the Global Currencies from the existing records from the Companies, which are populated on the Currency Dashboard, new Variables GlobalName and LCYCode are now used in the different Functions, the first part of code checks if there are Global Currencies . The Code Loops through the Company Currencies adding a record for the “Global Company” if it does not already exist. 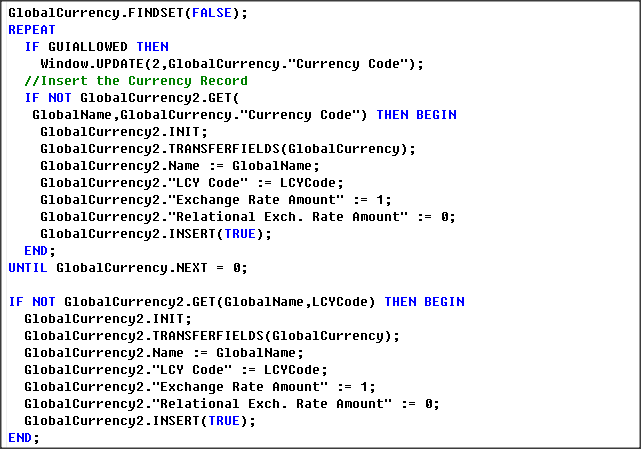 This function Loops Through the Different Company and Updates the “Currency Workbooks” with Related Records, it starts deleting all “Global Exchange Rates” and entering a “Global Name” Locked Record for the LCY Code. 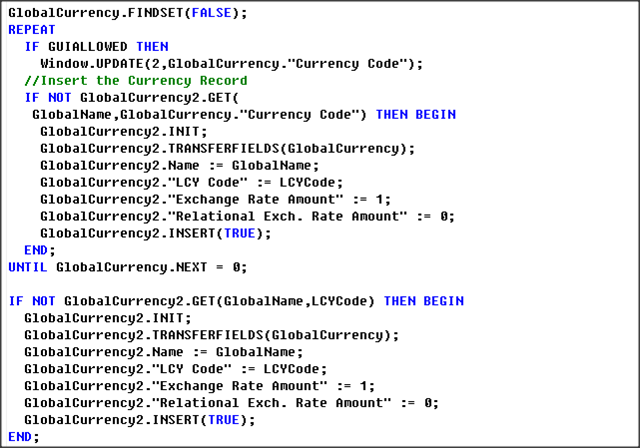 Looping Through the Company Table to see if there are any Currency Records, getting the G/L Setup and testing the “LCY Code”. 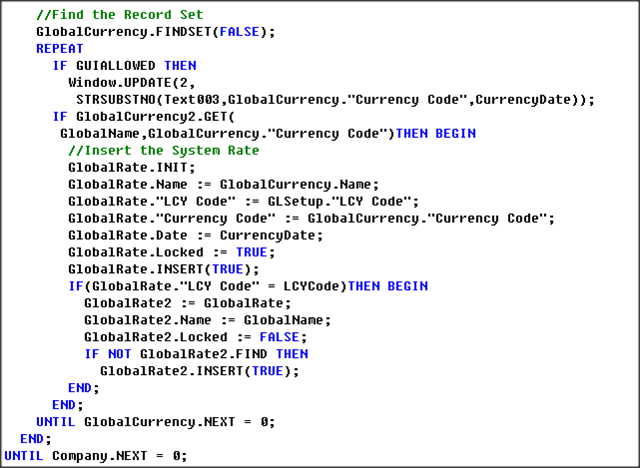 Only if there is a Global Currency as well as a Global Currency a Locked Company Record is Inserted, if the “LCY Code” is equal to the Global LCY Code then an Un-Locked Global Record is Entered. 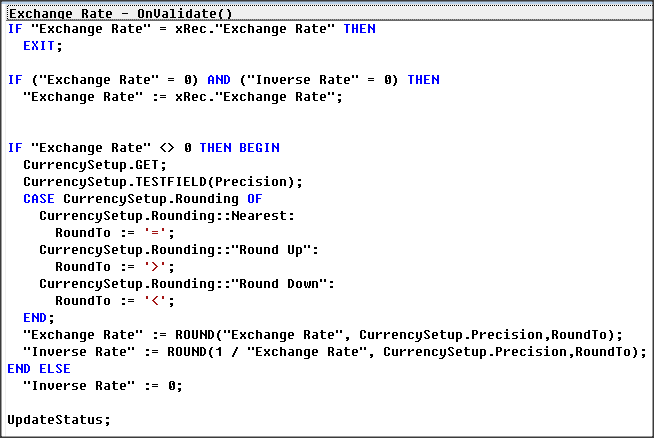 This Function adds any Missing Global Currency Exchange Rates after calling the GetGlobalRates Function. When the Currencies are found the code Loops through and Adds a record for the ‘GlobalName’ if one does not already Exist, note the use of the Variables GlobalName and LCYCode and the “Exchange Rate Amount” Rate is set as 1. The Code that Triangulates the Company Currency Exchange Rates can be found if this Function, if the Global Currency was GBP and the Company Exchange Rate Record had an LCY Code of EUR and a Currency Code of USD, then the Global EUR and USD records are found and the Currency Rate is Triangulated. I hope this Post is of Use, Please take time to Comment and Feedback, I will Post Module 3 in about a Weeks Time.